Rustic-themed decorating is a popular route to go in a new log home. While it can be a fun option, it’s important to make sure you’re keeping a balance between design and functionality. 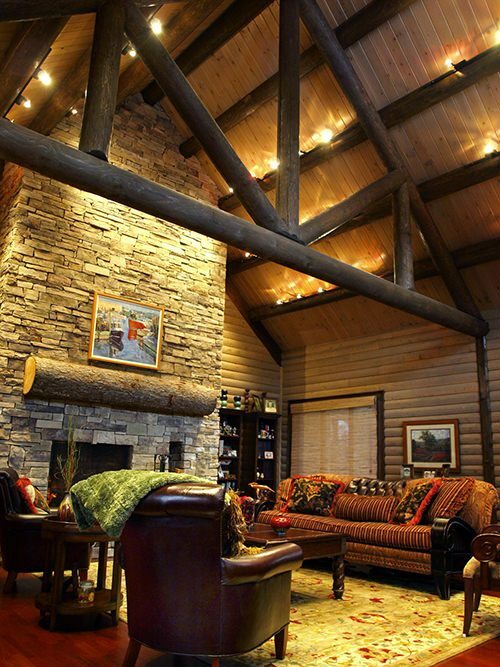 Lighting a log home can be challenging for first-timers, since the wood interior walls tend to soak up the available light. If you opt for darker interior stain, you’ll need even more lighting than a lighter stain would require. You’ll want to design in plenty of electric lighting options and get it right the first time around. These two items are big players in the rustic décor, as they are often the lighting focal point in great rooms and open plan designs. Going for a dramatic look when there’s plenty of space to support a large lighting piece is the way to go in a vaulted or cathedral ceiling setting. The right chandelier lighting can cast a lovely warm glow and enhance the room setting. 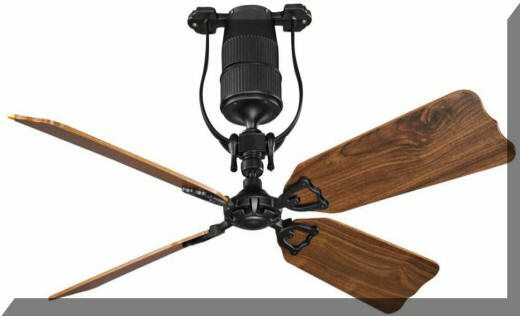 A ceiling fan or two in tandem with a large chandelier can balance a “statement” piece, but make sure that a ceiling fan presents a more functional look, so as not to diminish the impact of your wrought iron or antler or pressed metal centerpiece lighting. Lighting the upper limits of the cathedral ceiling area is also important to avoid a cavernous feel. Plus, you’ll want to be able to show off all the details of your log trusses and purlins that make your home unique! This can be achieved by strategically placed LED lighting, both upward and downward, along perimeters of the room and incorporated into the structural details. Select the right kinds of LEDs and compact fluorescents that emit a warm spectrum of light, otherwise the effect will be cold and glaring. 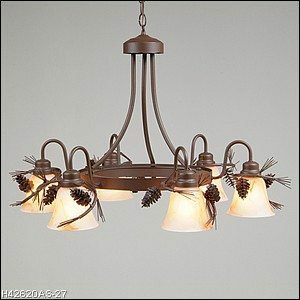 Accent lamps are a fun way to add rustic elements to a room. Select motifs that involve nature, like trees, leaves or plants, using wood, ceramic and metal for a variety of effects. Situate these smaller lamps on side tables and next to reading chairs to bring the light to needed areas. Lamps also offer different options for shades. Parchment, metal and glass or fabric shades can also evoke a rustic sensibility. A good complement to rustic décor is to add collectible items that convey simpler times. Advertising signs, collected bottles or kitchen tools can add a personal touch to a rustic interior. Kitchen work areas, including a central island or seating area can be illuminated with small but powerful LED pendants. Dropping the lighting from a tall ceiling source to within a few feet of the work area is a very practical approach in kitchens. Pendants can accent a lodge-like décor, with a black metal shade or copper finish to complement the overall rustic feel. Sconces add an elegant touch to broad expanses of log walls or hallways. 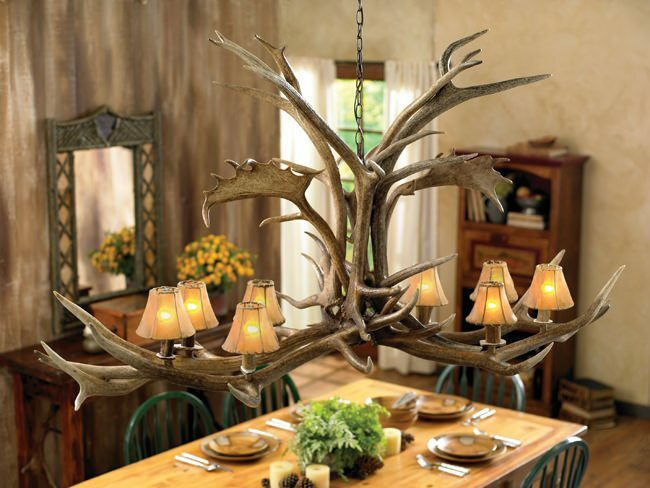 Sconce shades can be a terrific representation of rustic elements, and can also incorporate rustic favorites, like bears, deer, antlers, trees and foliage. If you’re counting on a trophy moose head or magnificent Western style painting to be a decorating focal point, don’t neglect to provide lighting for these pieces. This is one area where a lighting designer or art dealer may be able to assist in putting your collection in the best possible light. Rustic may not be carried in the local box store lighting center, so online or special order may be the best choice to find the perfect chandelier, lamp, or sconce. Visiting arts and crafts shows can yield some interesting choices, and commissioning a piece from an artist you admire is also an option worth checking out. Antique dealers and architectural salvage stores are also a good source for interesting lighting options. With the latter, you’ll want to have the wiring inspected and replaced to meet codes and ensure safe operation.